For me this clearly showed the second part of the mashing in process: the stirring of the mixture. Although there was less steam present for this part of the process there was a bit and so there was still some atmosphere while still retaining an accurate representation of the environment. I changed the camera angle slightly, while still photographing from a high viewpoint looking down I moved round to the right a bit. This was in order to show another part of the brewery and suggest to the viewer that this was a different part of the mashing in stage. 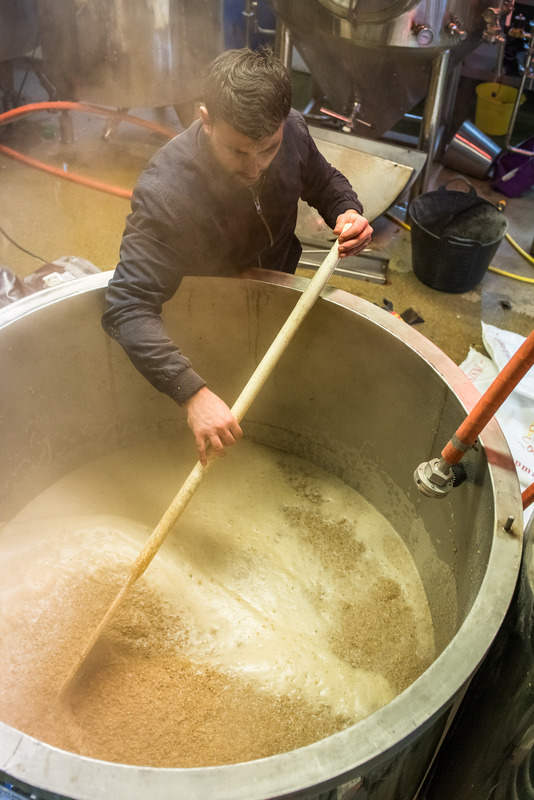 Instead of using a small spatula instrument like the man stirring in Photograph 7 – ‘The Brew School in Full Flow’ was, the brewer used a massive paddle to stir in the grain. Therefore the contrast was obvious in scale from Photograph 7 up to Photograph 9 (similar as with Photograph 7 up to 8). f/4.5, 1/200s, ISO 2000, focal length 35mm, handheld.